Most children love to create artwork, and between at-home doodles and school projects, your child's creations can really start to stack up. So we decided to come up with creative ideas for preserving and showing off your child's artwork in a design-savvy way. After all, as parents we are very proud of our budding artists and find it hard to part with their art, but once the refrigerator and bulletin board are covered, what are we suppose to do with all of these masterpieces? One of the simplest ways to preserve your child's artwork is by scanning each piece or taking a digital photograph, then recycling. However, if you are like me, the idea of simply tossing original art in the recycling bin is just not an option. There are many other ways that you can preserve your child's most creative masterpieces, without tossing them in the recycling bin or cluttering up your home. Read on to learn my favorite 7 ways to use your child's artwork. 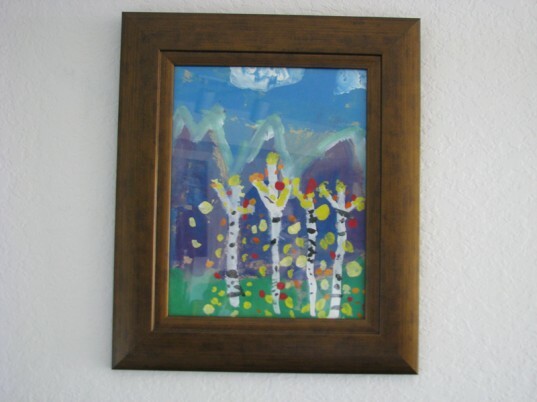 One of my favorite ways to preserve and showcase children’s artwork is by framing pieces like fine art. Pick a piece that matches your living, dining or family room and put it in an elegant frame. When guests comes over, the first piece of art that they will comment on, very well may be the piece that your little Picasso painted. 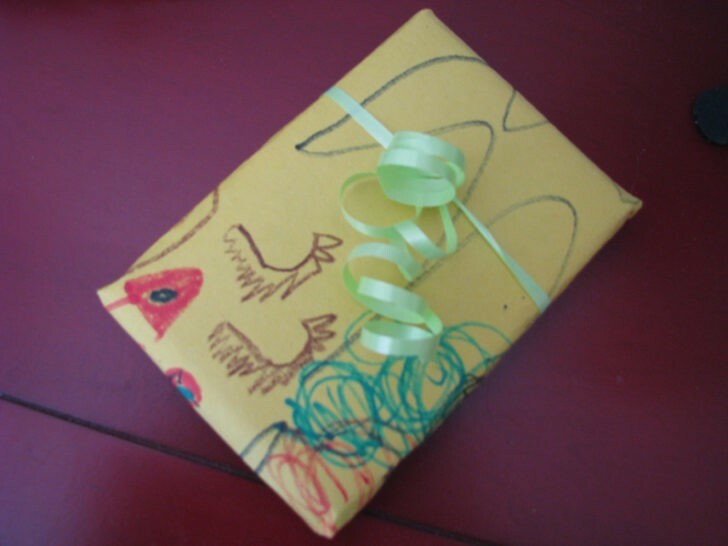 A great way to get a lot of uses out of your child’s art is by cutting the artwork into gift tags, wrapping paper, stationary and note cards. This is a great way to use your child’s artwork to send cheer to someone else. Another option is to frame a special piece of artwork to give as a gift to a grandparent. A fun idea is to save the best-of-the-best artwork that your child created in a box until they are grown up. At that time you can frame a few pieces and give it back to him as a gift. My grandmother did this for me. When I got married, one of my wedding gifts was a ceramic rainbow that I had painted and given to her as a child. 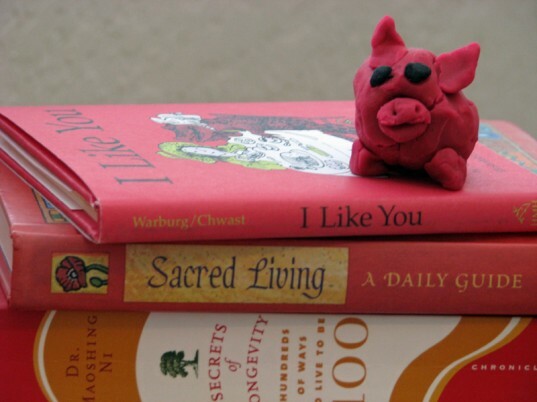 I have an adorable miniature pink pig that my son Eben created for me out of clay, which I plan to gift it back to him one day when he is grown up. 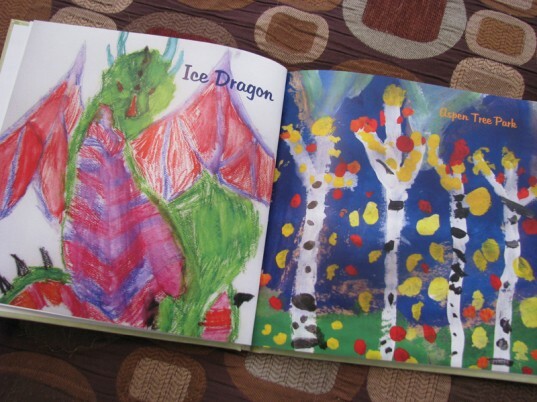 Another great way to showcase your child’s artwork is by scanning the pieces and then having them printed in a photo book. One year, I scanned all of my son’s favorite art pieces and presented him with a book of his art as a birthday present. He was blown away – the thought that he was a “published” artist really won him over. He loves to share his coffee table art book with friends and family when they visit our home. 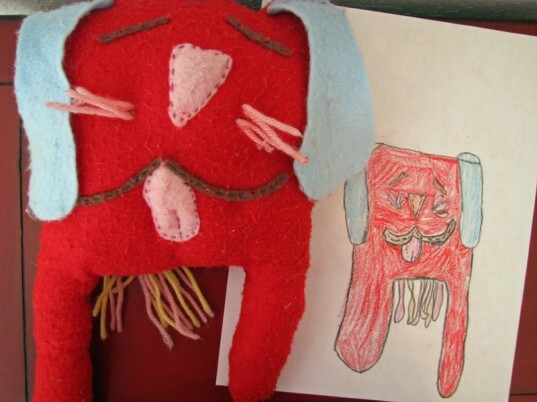 A fun way to bring your child’s artwork to life is by recreating it as a plush toy. My son drew a fun picture of a silly looking dog that hung on our bulletin board for ages. As a Valentine’s Day gift, I took some fabric scraps and recreated his silly dog into a stuffed plush that he could hold and love. If your child wants to keep and have access to many of their art pieces, consider keeping their creations in a large portfolio. There are many great options that are large enough to hold even the oddest sized pieces, slim enough to store in the back of a closet or under the bed and they have a handle to carry it with. A portfolio gives your child control of their own artwork. 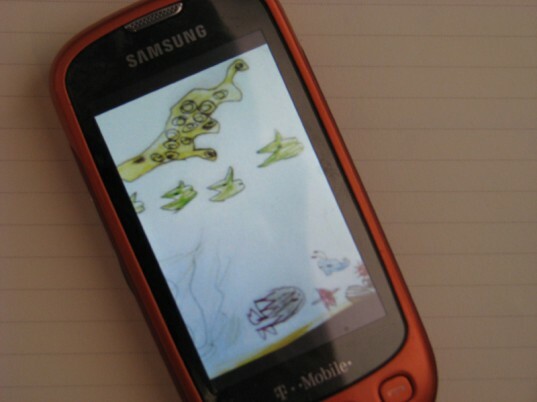 By scanning and saving a digital copy of your child’s best art pieces, you can have access to them over and over again. 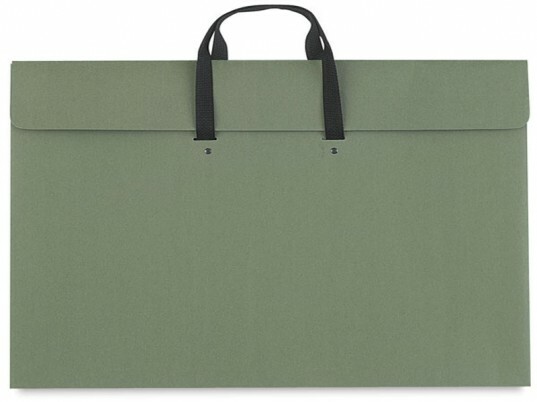 You can simply pull the file up to print stationary, holiday cards or even print the design onto fabric that can be used to make other gifts. Digitizing your child’s artwork gives you the ability to share it with many people in the form of something else. You can also use it as wallpaper on your computer or smart phone or share it via your favorite social networking site. One of my favorite ways to preserve and showcase children's artwork is by framing pieces like fine art. Pick a piece that matches your living, dining or family room and put it in an elegant frame. When guests comes over, the first piece of art that they will comment on, very well may be the piece that your little Picasso painted. A great way to get a lot of uses out of your child's art is by cutting the artwork into gift tags, wrapping paper, stationary and note cards. This is a great way to use your child's artwork to send cheer to someone else. Another option is to frame a special piece of artwork to give as a gift to a grandparent. Another great way to showcase your child's artwork is by scanning the pieces and then having them printed in a photo book. One year, I scanned all of my son's favorite art pieces and presented him with a book of his art as a birthday present. He was blown away - the thought that he was a "published" artist really won him over. He loves to share his coffee table art book with friends and family when they visit our home. 5. Create a Toy A fun way to bring your child's artwork to life is by recreating it as a plush toy. My son drew a fun picture of a silly looking dog that hung on our bulletin board for ages. As a Valentine's Day gift, I took some fabric scraps and recreated his silly dog into a stuffed plush that he could hold and love. 6. Put it in a Portfolio If your child wants to keep and have access to many of their art pieces, consider keeping their creations in a large portfolio. There are many great options that are large enough to hold even the oddest sized pieces, slim enough to store in the back of a closet or under the bed and they have a handle to carry it with. A portfolio gives your child control of their own artwork. By scanning and saving a digital copy of your child's best art pieces, you can have access to them over and over again. You can simply pull the file up to print stationary, holiday cards or even print the design onto fabric that can be used to make other gifts. 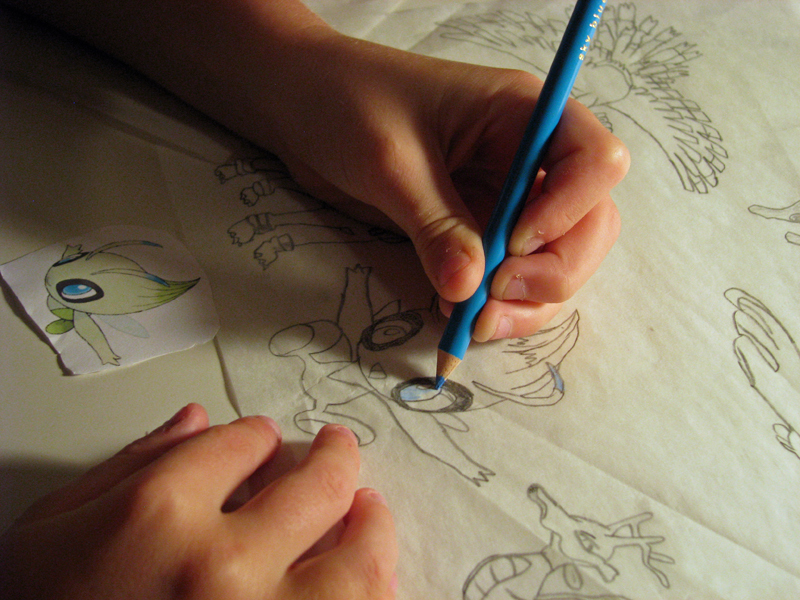 Digitizing your child's artwork gives you the ability to share it with many people in the form of something else. You can also use it as wallpaper on your computer or smart phone or share it via your favorite social networking site.